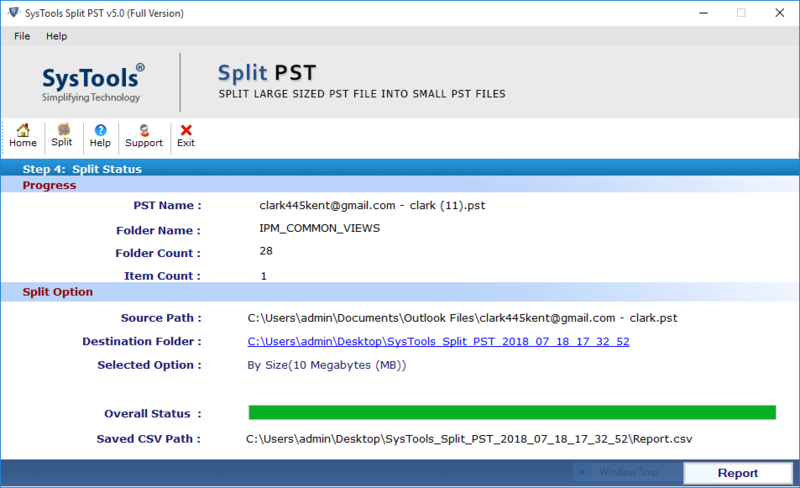 Split PST Tool is a comprehensive utility designed for Split Large PST files into Smaller PST in order to save it from being corrupted. The software divides large PST file according to date, size, year, and folder. The advance functioning of the software maintains the metadata intact even after splitting. What Makes The Tool Perfect? 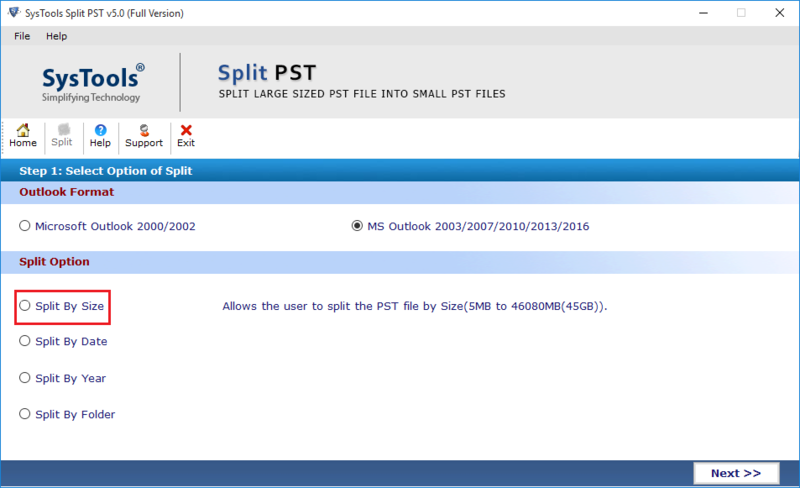 Split Large PST files into Smaller PST by current date, size, folder, and current year. Support to split both ANSI and UNICODE type PST files. 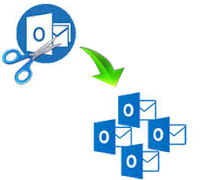 Option to divide Outlook archive PST without any data loss. Splits all the PST file attributes-emails, contacts, tasks, etc. Save the output files in a new folder from the software panel. No size limitation is imposed on the input Outlook PST file. MS Outlook installation is necessary for splitting the PST files. Log report is generated once the PST file is successfully split. Corrupted PST files have to be repaired before splitting them. Extends support to MS Outlook 2016 & all the below versions. MS Outlook is one of the most recognized desktop-based email client, used in both mid-scale and large-scale organizations.The entire Outlook data, its emails, contacts, calendars, etc. are stored in PST (Personal Storage Table) file. In the earlier versions of Outlook, i.e. Outlook 2002 and earlier versions, ANSI PST files were used for storing its data. The maximum size of the ANSI PST files used to be 2 GB. In case of exceed in this limit, the PST file ends up in getting corrupted. On the other hand in Outlook 2003 and later versions the UNICODE PST files have the maximum mailbox size as 50 GB. However in cases of exceed in size above 10 GB, Outlook shows performance issues and may end up in corrupting the entire database. Therefore, in order to prevent the database from corruption, splitting the PST file is considered as one of the easiest and safest option. 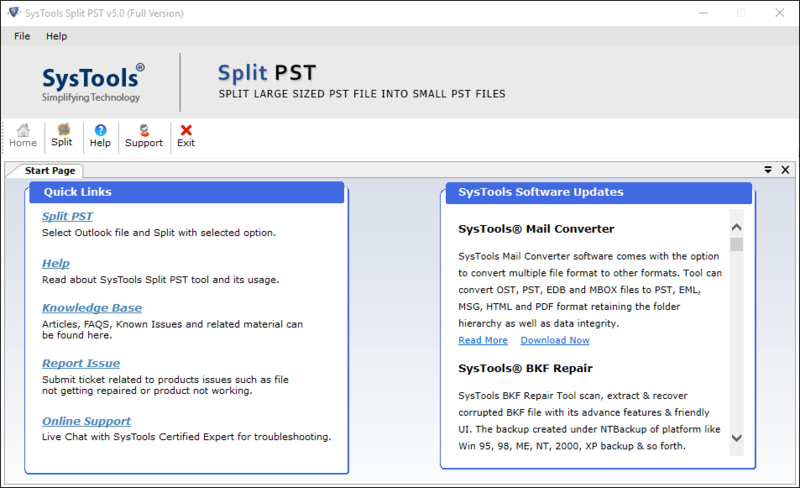 Why Is Split PST Tool Globally Recognized? Considering the popularity and implementation of MS Outlook by a number of business enterprises, it is likely that the database is prone to corruption due to increase in the database size. Therefore, for this very reason, Split PST is an exemplary software designed to Split Large PST files into Smaller PST. How can I split PST based on date? The PST can be split according to date by providing the date range. The software will split the PST file into 2 parts-one containing the mails that lie before the specified date and of the specified date and the second PST that contains the mails lying after the date. "Split PST is the best professional tool that I have ever come across. I was hesitant in deploying it for the first time, but when I did, it only brought satisfaction for me. I am really glad to have this tool." "Organizational data tends to be large in volume and hence occupies more memory. I also had a large PST due to which Outlook was showing performance issues. When I deployed Split PST, the software split the large database in multiple PST files and that too without any data loss."